The Long Island Tax Resolution Process provides a powerful strategy to help solve your IRS or NY State tax problems. After your free consultation, you have the choice of hiring us as your tax resolution consultant. All our new clients are required to sign an engagement letter as well as the mandatory Power of Attorney Form (IRS Form 2848). Your assigned tax resolution consultant will then interview you to further understand your situation and financial profile. After getting your tax history from the IRS or State, we will try to understand your exact tax debt situation by using this tax history and the financial information you provided in the previous step. This helps us lay the groundwork to create a solution specific to your tax problems. Multiple tax resolution alternatives are analysed and studied for their possible inclusion into the overall solution, and several are selected which roughly fit your specific situation. 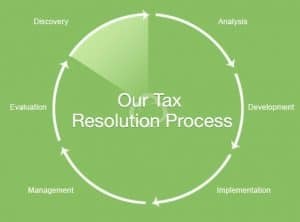 We then combine parts of each resolution alternative to create a highly personalized tax resolution plan for you. At this point, we also make sure that you are current with your tax return filings. We present your proposed tax resolution plan to the IRS or State. We check the progress of this plan throughout. Usually, the IRS or State will seek added information. This personalized tax resolution plan is presented to the IRS or State, and we will also address any requests for additional information from the IRS or State. At every point, we monitor the progress of this plan. Your tax resolution consultant will constantly be in touch with you to keep you up to date with your tax resolution proposal status. Once the IRS or State reaches a first resolution, we will help you decide if this is the best that can be agreed upon. Usually, we will need to present the plan a second time. The final resolution provided will definitely satisfy you. In the rare case that it does not, we will advise you about alternatives and any other steps to be taken to ensure your tax problems are solved.